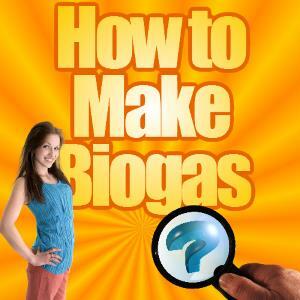 So, “How to Make Biogas” is the question, and the answer is; “How would you like to make biogas?”. There is a choice to be made, and these days it is quite a wide choice, as we explain below. If you have arrived here looking for information on how to make your own biogas at home or from a smallholding we recommend that you follow the link below this info box. Quick Link to “How to Make Biogas” Video Page for Biogas Plant Self Assembly Instructions and Training CLICK HERE! All others continue to read our article below. If you think for long you will find that there are a great many different anaerobic treatment processes, and new proprietary variants are being developed almost monthly. dry process anaerobic digestion of Municipal Solid Waste (MSW). to provide treatment of an MSW to make it suitable for diversion away from landfill, with biogas generation optimized for revenue creation, and potential sales of fibrous, and liquid fertiliser by-products. We have separated our technology page into two process categories, (1) wet, and (2) dry anaerobic digestion. A discussed above, the above processes mostly comprise wet (liquid based) processes for the treatment of general organic contaminants, however, other processes are used to optimise specific chemical removal, such as the anaerobic suspended growth processes associated with biological phosphorus removal. There are always exceptions to the rule, and a recent and innovative UK system (by Portagester) is probably, one such. This system separates the initial digestion stage from the final stage which takes place in a traditional type tower digester, by using portable reactors which are trailer or skip mounted units for the first stage, followed by a static AD reactor stage. We understand that the Portagester can also be used for both agricultural and MSW applications. CAMBI (Norway) have one of the most sophisticated Anaerobic Digestion processes, as their designs have included an initial hydrolysis stage, plus a final stage to upgrade the raw biogas to the more highly valued pure methane which suitable for transport use (after compression), and potentially also for injection into the regional “natural gas” distribution pipeline grid. The anaerobic digestion of sludge is another use of anaerobic treatment processes, and historically in the UK and possibly world-wide, the anaerobic digestion of sewage sludge has been the largest market. However, on-farm anaerobic sludge digestion mostly of animal excreta as slurries has been carried out for many years, although it has not been common to see these plants until more started being built in recent times, due to beneficial ROCs payments etc. Finally, in any list of anaerobic treatment processes, the humble home or community anaerobic digesters used in increasingly large numbers in China and India particularly must be featured, These low-tech digesters often provide their owners with direct use of the gas produced in the local homes for cooking and sometimes heating, must comprise a very important process. For example, technology-providers such as Linde (Germany) have developed the dry anaerobic digestion process, solely for the processing of MSW. The the image we use to explain how biogas is made via a sequence of process variations, is shown in the image above. 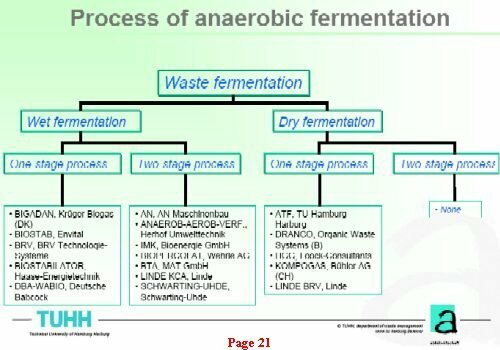 It comes from a presentation (downloaded in 2005), from a TUHH, Department of Waste Management Workshop in Anaerobic Digestion and Production of Biogas, by Prof. Dr.-Ing. R. Stegmann, Dipl.-Ing. Olaf Bade, Chimatra Workshop 2005. It clearly classifies anaerobic fermentation process variants, between wet and dry process, single and two stage, and lists the main European providers in 2005. I appreciate you sharing your interest in AD. Have you been in this industry for many years alerady? Really looking forward to read more. Awesome. making biogas is really simple. It is nothing else than easy, as I proved to myself by trial and error over many years. however it is simply a fact that they demand attention daily. People find that hard to believe, but the wise person never stops taking note of biogas plant changes, and fiddling with dosing rates.